I also love thyme and I use it on everything... poultry, veggies, bread :) The potatoes sound delicious! I love Thyme too - have it in the garden and try to use it as often as possible - I even put it in our salad! Your picture is making me hungry. I love roasted potatoes. We always use whatever herbs we have on hand but thyme is one of my favorites. I also love the combo of rosemary with sweet potatoes! Hi Cassie, rosemary and potatoes go well together... yummy! I love thyme with potatoes...such a delicious combination! Hi Kate, I use thyme a lot too. Hi Stacy, I would love to have a garden. Delicious - I love Thyme....especially with potatoes! As usual, a great history on your subject! I agree with thyme on potatoes, too. My husband's family taught me to use thyme on a baked chicken. So amazingly good. These potatoes sound delish and I'm so happy to have found your fabulous blog:) Looking forward to you next delicious post! Great recipe Christine! I have fresh Thyme in my garden and I always looking for new ways to use it. I used to avoid thyme and now I love it. It also lasts quite a while, which is important to me as I am usually only cooking for myself and don't use much at a time! I think I will buy a thyme plant soon, but as much as I can cook, I sure can't get a plant to survive! Roasted potatoes are my favorite side dish for grilled meat, but I've never used thyme. Looks great! I love thyme on anything, especially potatoes. I completely forgot how well they go together! 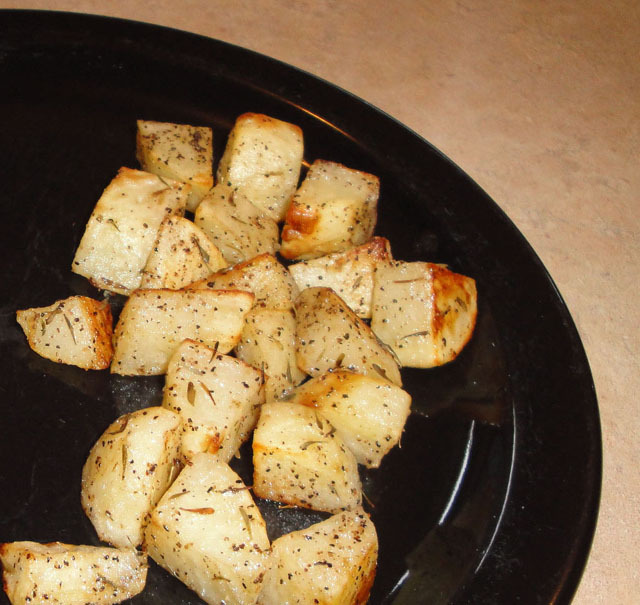 I love using thyme with roasting potatoes - add a little lemon juice and I'm as happy as a clam! Lovely to hear the background by going back in thyme. Sorry, couldn't resist. Isn't it funny they used it to inject some bravery? Love the look of the potatoes - so tasty. I've got 3 different thyme plants and love excuses to put thyme in so many dishes. Never thought of the bath, too! Hi Beth, love thyme, but a little bit goes a long ways. Thyme and potato perfect culinary match. This is a side with endless kitchen applications. Hi Lazaro, thanks so much. I love thyme and use it all the time. it's close to midnight and seeing your delicious potatoes is not a good thing. I sure want some right now!!! this is so good to goes with any roast meat..
Wow, this looks so interesting! A baked potato dish like this is surely a winner. Christine, you rock! We tend to forget sometimes how great the simple foods are. Thanks for the reminder. I adore simple roasted potatoes. We have them at least a couple times a week. I am really enjoying your blog today. I like all of the food history! I'm a very happy follower of yours now. Thanks! Hi Joe, next time you make roasted potatoes, try my recipe, I think you will like it. Thyme and potatoes are a perfect match.